Way, way back when you used to have to show up and actually watch candidates debate (think Lincoln-Douglas). Then it was radio, then TV. I remember listening to the Bush-Gore debates on the radio with my parents. 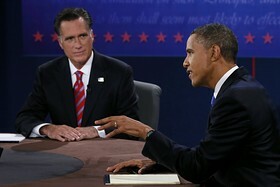 That was just twelve years ago but you might not know it if you watched the debate the way I did. Does Obamacare ‘Cut’ $716 Billion From Medicare?